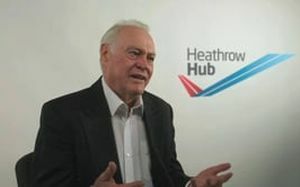 “The most frequently asked question about the Heathrow Hub extended concept for expanding Heathrow Airport is simply, “why has no one else done this before?” Our ideas could be used in other airports that have limited space to expand, one of the reasons why we have patented the scheme. There is an international interest. Heathrow airport has land readily available to the west but expansion is severely constrained north and south. The airport operations benefit from the prevailing westerly wind. Aircraft performance, including the brakes, have improved significantly to the point where 3,000 metre runways are now long enough for 21st century aircraft such as the A380 and Boeing 787. Heathrow Hub is not only safe but in my view safer than operating mixed mode from a single runway such as Birmingham or Gatwick. Looking at the commercial background, retailers such as Harrods, John Lewis, Marks & Spencer and Poundshop for example, do not compare their businesses with each other by looking at the different number of customers entering their respective stores. More important than sheer numbers is, how much each customer spends and what the profit margins are. Similarly, passenger numbers passing through an airport does not give a sensible measure of the importance or size of the business. This is reflected in passenger fare revenue at Heathrow being six or seven times greater than at Gatwick or Manchester. So, the types of passengers are crucial, as are the destinations and the service levels they demand which in turn is reflected in the fares they pay. For the UK the incoming passengers from locations overseas are arguably of more significance for our economy than UK residents travelling outbound on holiday. In the southeast of England, only Heathrow achieves the target of at least 50% inbound visitors, be they tourists or business travellers. No other airport comes anywhere close. It can’t be forgotten that these passengers have a choice. They don’t have to come to the UK. We need them more than they need us and so it is important that we facilitate their journey, their stay and if need be their business activities. What happens if you try to force an unacceptable element onto their journey by locating the airport in a more remote location? The answer is best provided by Montreal Mirabelle Airport where for 25 years the Canadian authorities tried to force airlines and passengers to use Mirabelle, an airport which, incidentally, is the same distance from their city centre as Gatwick is from Hyde Park. The attempt failed. Montreal Dorval, near the city centre, is flourishing and Mirabelle is virtually closed. So the solution, which really everyone knows for the expansion question, is Heathrow. The challenge is to complete the expansion with minimum cost and fuss along with reduced noise. That is where the extended runway concept of Heathrow Hub comes in. It’s good value, our latest estimate for the complete project is less than £10 billion. It is simple and displaces many fewer homes and businesses than alternatives. An additional benefit is the ability to construct in phases. The first phase would be to build the runway, taxiway and a few aircraft parking stands at a cost of less than £5 billion. Further expansion could then take place when required by demand and when there is even greater proof that noise and emissions targets can be met. Crucially, the concept enables a huge reduction in the number of homes affected by noise and does not require significant airspace changes to the east and west of the airport. This would be necessary with the Heathrow Airport plan, where positioning of aircraft in the air is essential to allow their three parallel runways to function efficiently. Not only do our proposals reduce all the noise envelopes and take hundreds of thousands of people out of the footprints, they do not bring large swathes of communities into new noise disturbance areas. Occasionally I still hear the question “wouldn’t Gatwick suffice?” The short answer is no. Personally I don’t even see how they could raise the capital required at a sensible borrowing rate; the risks are too high. For instance, in the last recession, Gatwick’s business reduced by more than 10%. My question however is why would they spend all those billions of pounds on expansion? Assuming the airport wants to expand, they could simply increase the length of their existing standby runway by 500 metres to the west and perhaps build a couple of taxiways, all at a total cost of a couple of hundred million pounds. This layout would be very close to that at Manchester and allow a significant increase in movement rate. Whilst this might solve future capacity constraints at Gatwick for a long time it will do virtually nothing for the UK economy. So it is clear that Heathrow expansion is the answer for the UK. The simplest way of achieving this is the runway extension concept. It’s cheaper, quicker and does not require airspace changes and with the help of NATS and the airlines, could dramatically cut the nuisance of aircraft noise. The final hurdle is emissions. Reducing emissions to safer levels is a legal requirement placed on the Government and one way or another will be achieved. Whether this is through eliminating certain vehicles, congestion charges and so on is not particular to the airport debate, although it is important to realise that aircraft emissions of NOx are only a tiny proportion of the total. I am confident that controls will be developed and these emissions will not inhibit airport growth. Whatever the arguments for or against expansion, this particular split-runway proposal is a hair-brained idea. The safety case is totally unproven, it's operationally inflexible and Heathrow Hub's own proposals are riddled with inconsistencies when describing how the scheme would operate. It isn't going to happen. A biased and misleading write-up. No mention of £5bn of infrastructure that the tax payer will have to find including tunnelling the M25. No mention of air quality No mention of the 70,000 additional homes needed in Heathrow area. No mention of this plans need to close one runway to allow certain stages of construction. Heathrow continue to increase profit with just two runways Giving a third runway to Heathrow will create a monopoly Also, the majority of RBWM residents are against further expansion of Heathrow and along with three other local borough councils have written to Cameron threatening legal action if Heathrow is allowed to expand. Expansion of Heathrow is not deliverable.